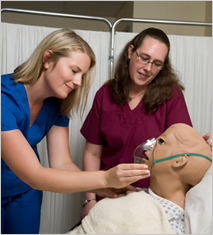 Start Your Advanced Nurse’s Aide Training Today! Why Become an Advanced CNA? Most Students Have Little to No Out of Pocket Expenses! What is the Job Market like for Advanced CNA’s? A Patient Care Associate isn’t your everyday Certified Nurse’s Aide. While the Nurse’s Aide training is a key component of the program, students will also receive training in phlebotomy, EKG, CPR, and First Aid and will learn the hands-on skills needed to provide for patients’ needs in a homecare setting. These additional skills and concepts will integrate graduates as highly qualified members of a medical team in hospitals and a wide range of long-term and direct-care facilities. Students are trained over the course of a four-to-six-month program including a clinical experience that provides students with the opportunity to demonstrate skills acquired in class in an active medical practice. Graduates earn a Home Health Aide Certificate and are eligible to sit for the State of Connecticut nurse’s aide certification exam. These credentials, along with the advanced PCA training, set our students apart from other applicants when entering the workforce. What is an Advanced CNA? Click Here to learn more about our Advanced CNA program!